Pressure from real estate developers in the San Francisco Bay Area has undermined regulations meant to protect shoreline from rising sea levels, according to an investigation by the San Francisco Public Press. The landmark California Environmental Quality Act, a key tool for city planners, has faced successful legal challenges from industry. As a result, state regulations have loosened and local governments have been slow to react. In San Francisco and across the region, local officials continue to promote large coastal developments despite increasingly dire scenarios precipitated by greenhouse gases, the melting of the world’s glaciers and the increasing intensity of storms. 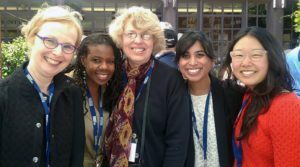 The Logan Symposium hosted in April by the Graduate School of Journalism at the University of California, Berkeley, provided some of our FIJ/Schuster Institute fellows an opportunity to meet and learn from some of investigative journalism’s best. For Linda Matchan, the symposium helped restore the “bounce” in her step and renewed her commitment to a discipline that, she said, can sometimes be discouraging because of “the many logistical and human obstacles that stand in the way” of stories. Like the other fellows, she learned immensely from the discussions led by some of the profession’s most celebrated talents. Washington Post reporter David Fahrenthold, who recently won a Pulitzer for his reporting on Donald Trump’s presidential campaign, was especially helpful in getting our fellows to think beyond traditional reporting and storytelling. Applications are in for a Director of Operations, a new FIJ position that will help Executive Director Sandy Bergo and the Board of Directors advance the organization’s mission of supporting independent investigative journalists. The new staffer will help ensure organizational effectiveness and efficiency. The position will oversee FIJ.org, publish this monthly newsletter and assist in managing grants, among other duties. As warming temperatures thaw the Arctic, pressure is mounting to develop new sources of oil and gas and expand shipping routes throughout the region. 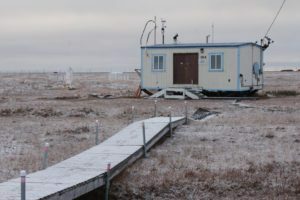 As Madeline Ostrander reports for “ensia,” the Arctic is especially vulnerable to a type of air pollution called black carbon, and scientists are scrambling to understand and mitigate its impacts before it’s too late.